At least two people died on Sunday morning and 25 others were injured when a large fire broke out at the French ski resort of Courchevel, authorities confirmed. At least four of those injured were in a serious condition although their vital prognosis "is not engaged," the Prefecture told Euronews. They were transported to hospitals by helicopter. 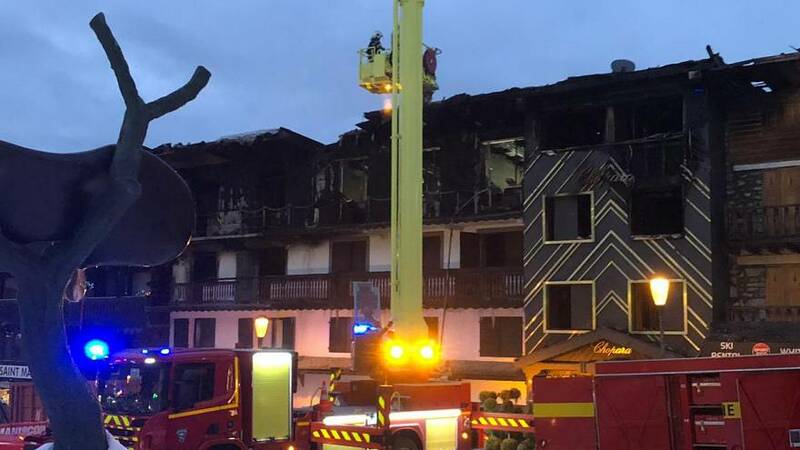 The blaze erupted on the third floor of a building housing seasonal workers in the heart of the alpine station, located in Savoie, in eastern France, at around 04:30 CET. Some 130 firefighters were deployed to tackle the blaze, which was contained at about 08:00 CET. Footage on social media, which Euronews has not been able to confirm, show flames engulfing a balcony and reaching into the night sky as a crowd amassed on the street. Some 60 were evacuated and are currently being cared for in a local public hall. Families worried one of their loved ones might have been affected can call 00 33 800 208 902. French Interior Minister Christophe Castaner praised firefighters on Twitter and said his "thoughts are with the families and loved ones of the victims of the fire that has just plunged Courchevel in mourning."